I retired from medical engineering when I was 47 because I decided that time had more value than money. The common expression “time is money” is ludicrous. Time isn’t money, it’s time and it can’t be bought because it’s not for sale. So I developed a lifestyle where money isn’t that significant. If we were to become financial destitute tomorrow it would change very little in the way we live. 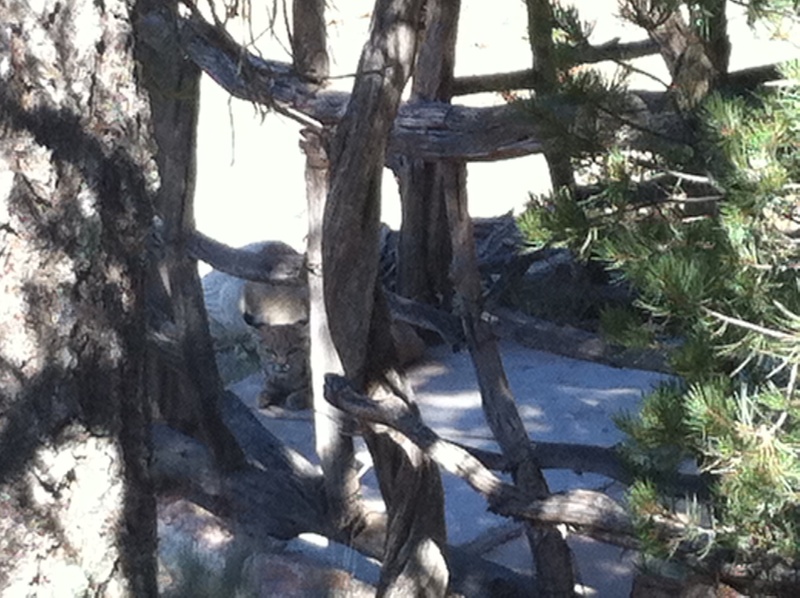 If you look closely you’ll see the Lynx which stopped by the other day for a little water and a nap. In the summer we get a variety of guest seeking the shade and cool concrete of the gazebo. From rabbits to rattle snakes they all seem to know about the gazebo at Hermits Rest. And yes I know, rattlesnakes? Well it’s quite the experience to be working in the gazebo, notice some movement in your peripheral vision, and discover an adult rattlesnake simply passing by you on its way to its favorite napping corner. It’s quintessential mutual acceptance, absent of prejudice and fear. It’s one of the best ‘spiritual experiences’ I’ve ever had. I’ll take being totally accepted by the critters in nature over ‘enlightenment’ any day. Now my wife is a whole other story and I’m posting this to give you and my long-term reader friends a glimpse of the woman who not only tolerates but actually loves my company along with the composting toilet, the 230 square foot wilderness hermitage that’s powered by two golf cart batteries via the sun and that using a total of six gallons of water a day isn’t conserving, it’s all that’s necessary. In fact she spends more time telling me what we don’t need than what we do because she says we have everything. Lori is a wizard of nature, a natural naturalist. The other day I saw her going for a walk and chatting with one of her favorite tarantulas who was literally walking alongside her. No kidding, she not only knows this particular tarantula she knows where it lives and that it had babies last year. Golden eagles swoop down on occasion and give her a wing wave and ravens hang out with her in the gazebo. The wildlife may think ‘oh it’s just him’ when they see me but when she steps outside you can almost hear them say ” hey there’s Lori let’s stop by and say hi.” She’s even a doggone barometer. She can step outside, look at the sky and then tell me there’s a storm circling around from the south but it will come in from the west in about an hour. If she tells me this at 2 p.m. you’ll find me closing the windows at 3 because sure enough..
Now while I spent years reading the ancient teachings and got the doctorate, Lori simply ‘got it’ at the moment she blessed this earth with her presence.